Choose among a Shimano/Sram 11x compatible freehub body and a Campagnolo freehub body! Choose amongst high-quality Enduro Abec 5 stock bearings or the high end coated Ceramic-Hybrid bearings of the Danish specialists of CeramicSpeed! King of Mountain with a set weight of a sensational 790 grams. For 2017 our shallow tubular rim and best practice model, the Ultra 24T, has completely been reworked. The successor, the ax 25T, now is 25 mm deep and with its width of 20.5 mm boosts a weight of under 200 grams, so that a wheelset weight of 790 grams can be realized. The ax 25T omits the integrated logos on the rim and improves its aerodynamical performance thanks to a revised rim shape. The stepped and mechanically machined brake track further improves the braking performance even in difficult situations. The Ultra 25T is a real climber and King of Mountain as it already has proven with numerous race wins, regardless if Alpine marathon or mountain time trial. Despite of its sensationally low weight the Ultra 25T sports outstanding stiffness and stability values that grant it a rider weight limit of 100 kg and not only make it the weapon of choice uphill but just as well also when the road goes down again. 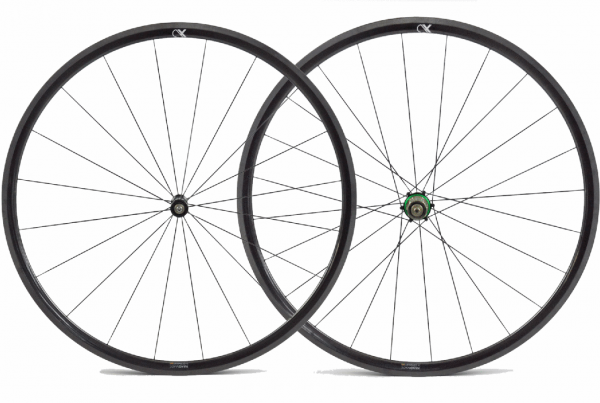 Our Ultra wheelset invariably rely on high performance hubs from Extralite. The Italian lightweights are some of the lightest hubs on the market. An intelligent, elaborate construction by means of FEM-analyses are a guarantor for a high durability, reasonable features such as an adjustable bearing play a high suitability for daily use. New for 2017 we optionally offer our Ultra wheels with Ceramic hybrid bearings. As we do not settle with the second best, we only offer the highest quality of bearings from CeramicSpeed. The Danish specialists are renowned as the nonplusultra for years and have wins in about every single race globally available in their palmares. Customer evaluation for "Ultra 25T"
Hard to believe these are real! I purchased these wheels with the ceramic bearing option and mounted Vittoria Corse Competition tubulars. Initially, the hubs felt sluggish, just like regular steel bearings with new grease. I now have 300Km on the wheels and they are very free and smoother than anything I've felt. I can actually feel the ultra smooth rolling action of these hubs. I weighed them out of the box and they were 777g (for both wheels.) I didn't believe it so I weighed them on another scale and it was the same result. The finish of the carbon is unbelievable. The tubular bed is the perfect shape for 25mm tubulars so that the edges of the wheel fill the gap smoothly. Finally, they feel stiff when out the saddle. I am very happy with this purchase.